Now that the kids are back in school, or will be soon, are you ready to enjoy a little quiet time to yourself to relax? Lighting some scented candles and soaking in the tub with a good book sounds pretty awesome right about now. I actually don't keep many candles in my house, four little ones and fire just doesn't mix, however a candle with some jewelry hidden inside is something I would definitely enjoy! With Fall just a few weeks away, the Pumpkin Spice candle from Jewelery Candles would be the perfect scent for me right now. Jewelry Candles is a candle company which produces the highest grade soy-wax candles (which burn for up to 150 hours), with an added bonus. Buried inside the candle, a piece of jewelry is hiding, just for you! Inspired by the American Classic, Willy Wonka And The Chocolate Factory! Instead of a golden ticket in a chocolate bar, you get Premium Soy Wax Candles with jewelry hidden inside worth anywhere from $10 to $7500! You may get a ring, bracelet, necklace, pendant, anklets or beautiful pair of earrings in your candle! You just never know what you are going to get! With over 30 different scents, Jewelry Candle is sure to have something you'll love. These candles make a great gift for a sister, mom, or friend. Jewelry Candles are currently priced at $24.95 per candle, or $120 for a five pack. Plus, if you love what you get, you can sign up for their brand new Candle Club. Whether it's costume jewelry or the real deal, fans are delighted to find their little foil package, and unwrap their surprise. You can learn more at JewelryCandles.com. Become a fan on Jewelry Candles on Facebook to enter their giveaways and stay up to date on new and exciting scents. 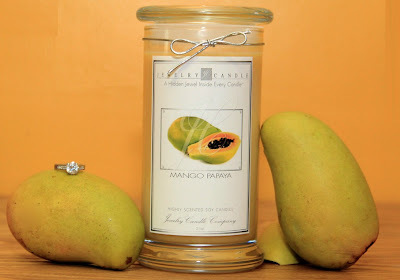 Because we love our readers, these blogs have joined together with Jewelry Candles to host a giveaway for a Mango Papaya Jewelry Candle! Visit these great blogs to read fun articles, enter more great giveaways, and get great tips on everything from eating Gluten Free, Green Living, Recipes, Coupons, and more! One (1) winner will receive a Mango Papaya Jewelry Candle. This giveaway is open to US residents only and will end on September 15, 20120. Please use the Rafflecopter form below. Good luck! Cool concept!!!!! I love jewelry! I love candles! It was inspired by the American Classic, Willy Wonka And The Chocolate Factory! I learned that paraffin wax emits harmful vapors which contain carcinogens (cancer causing agents) and petro chemicals. The Smoky Mountains Cabin candle sounds fantastic. I learned that Jewelry Candles are made from 100% soy which is a natural, renewable source. They also burn longer than paraffin candles. They currently have 18 different scents to choose from- nice! It was inspired by the American classic Willy Wonka and the Chocolate factory. I learned that Jewelry Candles are made from 100% soy wax and not from petroleum based parrafin wax, bees wax, or palm wax. I learned that they have an amazing assortment of scents. Nice!!! Plus they have a gorgeous website. very long burn time!! 100+ hours! I learned that all the candles are hand poured in Kentucky! I learned that soy burns longer than parrafin.